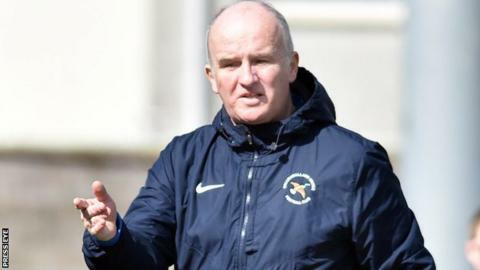 Ballinamallard have confirmed Whitey Anderson is stepping down as manager after 10 years in charge. His departure comes amidst uncertainty over the club's top flight status. The second leg of their promotion-relegation play-off against Institute was postponed by NI's Football League. Anderson told BBC Sport NI on Friday the club "don't know" if their season is over and revealed he had been thinking about resigning as manager since last September. Ballinamallard won the first leg of their play-off 2-1 last Friday but Tuesday's second leg was called off over allegations Carrick Rangers boss Gary Haveron did not properly serve a three-game touchline ban. It is claimed that Haveron should not have been in the Carrick dugout for the match against Dungannon, which they won 3-1. The Irish FA has asked Carrick to respond to the allegations, with the club in danger of being docked three points that would see them being automatically relegated. "I am committed and passionate about what I do," he told BBC Sport NI. "I never ever thought that I would be managing in the Premiership, let alone for four years so that has been a huge honour and a big bonus. "I have been thinking about going for some time, probably back about September if the truth be told. "I did stay on in the end but I had definitely made my mind up I would go at the end of this season. "I suppose the way things stand at present we don't know if our season is over yet. "It's unfortunate the way things are just now but I believe the Premier League is a good product. It has done nothing but enrich my life and I am grateful for that." Although he plans to take a break from the game, Anderson is likely to retain his association with Ballinamallard United in another capacity, possibly in youth development.